Position 2 (the argument that I have been making): that these clothes including mitre predate the fall of constantinople and are wholly appropriate for a bishop to be wearing. I was disagreeing with those who think we ought not to have our bishops dressed in "fancy" clothes. ...and agreeing with you, Father. I'm quite disappointed that you went with his false dichotomy. There is an option three. Those mitres do not predate the late Byzantine era but they aren't illegitimate. Don't be disappointed....because I really don't care "when" they exactly started. They have a long history, and have been ingrained into our traditions long enough, that I see no problem with them. I don't know the origin of half of the stuff I see in church....and yet, none of it is a stumbling block to me. My purpose for being there is not to dissect everything, but, to worship God....all these other things are only there to assist me in doing so. It shouldn't really matter to anyone "when" things started, at least in terms of legitimacy. It's part of our tradition. But I love history and learning the origins and reasons behind things. I have private opinions about things, like opposition to long hair and mitres, but I'm not going to say that they should be changed, it should just be optional. If a Bishop doesn't want to wear a miter, he shouldn't have to. Again, I would kindly disagree. He is not wearing the mitre for "himself", but, for "Christ". Correct me if I am wrong, but, I do believe that during the Liturgy the bishop, who is Christ's disciple wears the mitre. However, at key moments, he takes it off. Why? For example, while reading the Holy Gospel, he takes it off, because we are listening to Christ's teaching. During the Great Entrance, he takes it off, etc. These moments simply qualify that the mitre is not for the man who is wearing it, otherwise, he would be wearing it all the time. I think if a man is called to be a bishop, and volunteers, than he ought to carry out all the duties of a bishop, whether he is comfortable with it or not. Same holds true for clergy. When someone bows to kiss the hand of a priest, it's not so much the "man" they are kissing, but, the office that he holds. With his hands he distributes the Eucharist. We are told that if we meet an angel and a priest along the road, we are to first greet and kiss the priest's hand before acknowledging the angel. Therefore, the priest who removes his hand before it is kissed is doing his office a disservice. While I completely honor the humility this shows, truly....I still think it is wrong, because the person isn't kissing Joe, or Tom, or Mike who is wearing the fancy robes. They are kissing one of Christ's anointed priests, and the hand through which Christ Himself blesses them. How "necessary" is the mitre for a bishop when serving the Liturgy? In our tradition, our "mitre" is always a part of the vestments of a bishop. If he vests for the Liturgy, he wears it, period. But it seems that in the Byzantine tradition, it's a bit more optional. 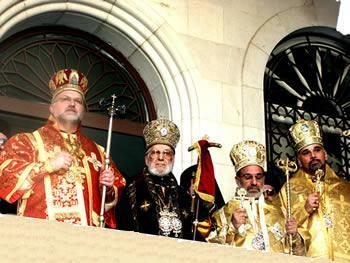 Bishops can, for example, serve "as priests" instead of "as bishops", and then they wear the omophorion and panagia, but usually not the mitre (instead, they wear the monastic headdress). In Greek traditions, it's not uncommon for bishops at a hierarchical Liturgy to wear their monastic headdress if they're not the presider. So is it possible that a bishop could regularly opt not to use the mitre? Syriac tradition bishops don't have a choice, even if they wanted one. I've only seen bishops serving wearing mitres. If they don't serve, they don't vest. A concelebration: the two patriarchs wear mitres, but all other concelebrating bishops wear monastic headdress for the Liturgy. Interestingly visitting MP Bishops also adopted this there. Could be, but do you have any proof for this? The Greeks are sorta lazy. More-or-less 20 year ago Patriarch Demetrius was visiting Warsaw. I was told that in Greek tradition only Church's Primates are allowed to wear mitres during the service so the Greek Bishops, who was accompanying him did not have their ones. They tolerated our Polish Bishops in theirs but when approximately 10 mitred Archpriests enterred the sanctuary they finally got nervous. One of the Greek Bishops called one of the Polish Priests and told him: Do you know, who is he? He's the Patriarch of Constantinople. Tell them to take THAT THINGS off! (Un)fortunately it was a newly-ordained Priest and he was too humble to ask his older colleagues to do it. Come to think of it, I've seen icons of Greek bishop saints, unless my memory is hallucinating, vested, but wearing monastic headgear. Maybe a post-Turkokratia thing? It isn't really a matter of wearing the mitre for Christ. It's a piece of clothing that was imposed on Orthodox Bishops during Turkish rule, and imported into Russia through Greek influences. It's not as essential as an omophor, which has been here since the early days. We've only had mitres in our Church for 400-500 years, about 1/4 of our entire history. I'm really interested in knowing what the origin of this practice is. Is it a matter of Greek innovation (or laziness, as earlier suggested), or is the real innovation the (over)use of the mitre by the others? It certainly seems dispensable in the Byzantine rite in a way the omophorion is not. I was told by someone that it's universal Antiochian practice but it does not seem so. Yeah, I've seen that photo before, and others like it. That's why I'd really like to know how this tradition of sometimes using mitres and other times using monastic headgear came about, and what the actual "rules" are. "Greek laziness" is too facile an explanation, and it's not even true. Greek tradition is different from Slavic tradition, but it's not "lazier". I'm not sure how much this contributes, but here's my Antiochian bishop with and then without (and later with again) his mitre from Pentecost 2012 at my parish. Interestingly, a ROCOR I believe from Holy Cross Monastery is also present. I think he takes off his mitre for the Gospel reading, but from another set from his visit in 2008. It does seem he puts it back on at some point, but I'm not sure when. Actually they do it. When they concelebrate with the Patriarch, they don't wear mitres. The same is true for the Greeks. Met. Philip is not Patriarch. The enthronement of Pat. John X in Beirut. The only bishops wearing mitres are the Patriarch himself and Archbishop Chrysostomos II of Cyprus and Met. 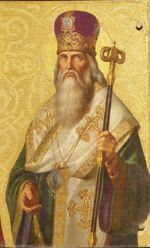 Christopher of Prague as Primates of their churches. The rest of the representatives wear klobuks. I think no one means that Greek and Antiochian hierarchs do not wear mitres at all. The tradition is that they do not do it when concelebrating with their Patriarch. During the Patriarchal Liturgy in Boston in 2008, Pat. Ignatius was the only one with a mitre. Never mistake the liturgical practices of the Antiochian Archdiocese of North America to be the norm for Antiochian practice. Obviously, the setting is unusual, but I think it's nice to see a bishop serve as a priest. Maybe a mitre could've/should've been used, but I think this works just fine. It is pretty common among Greek Catholics for bishops to serve like this. Recently Major Archbishop Sviatoslav concelebrated with Pope Francis like this. I've only seen once in real a bishop doing this (weekday Liturgy in a monastery he was an abbot of). There's not one practice in North America either, apparently. Just as there is not one Antiochian liturgical book that is not riddled with errors, in English at least. I saw a picture of that, but it seemed to me the Major Archbishop was wearing the sakkos. Was I wrong? When a bishop serves like this he never uses the mitre or Trikiria and Dikiria. He may choose to still use the staff to cense and when he preaches. So what are the rules on "headgear" for bishops in the Byzantine rite? It seems that the mitre is not an essential element of a bishop's vesture when serving. Is it ever "required", or is it just customary in some forms of celebration more than others? In our Church, a bishop basically vests like a priest, with the exception of the "mitre" and omophorion, which are always worn at every Liturgy. They are essential. And then he is assisted by two presbyters who wear mitres. Makes sense not. You know what they say about rules and bishops, it is more like the pirates code, they are guidelines. Oh, sure. But I didn't imagine it extended to vestments. Even the most rubrically emancipated bishop I've seen in our Church still wore/wears all the proper vestments. Presbyters in mitres? All the time. I also remember seing a picture of Metr. Jonah in phelon and mitre. I recall this also in the OCA-on one occasion especially because Abp. Job of blessed memory remarked that he stood for a moment, waiting for the Gifts to be elevated, until he realized he was serving as a priest, and they weren't going to elevate themselves. Mitring priests was dropped by the OCA in the 1980's some time, but was practiced before. We are talking about the video. Yes presbyters in mitres is a horrible Russian practice introduced by Catherine the Great. It really needs to be done away with (along with most of the Russian award systems that developed in the 1800's). Your comment has nothing to do with the discussion, and just confuses the conversation. I really doubt the priest assisting in this video would ever wear a mitre. We are talking about the video. No. We are talking about bishops' vestments in general. Yes presbyters in mitres is a horrible Russian practice introduced by Catherine the Great. It really needs to be done away with (along with most of the Russian award systems that developed in the 1800's). "My funny hats are more Orthodox than your funny hats". Your comment has nothing to do with the discussion, and just confuses the conversation. You could try writing less general and authoritative and it wouldn't be so confusing. You know, adding "in my tradition", "I've never encountered", "I'm not aware of" might help a lot. No the comment was on the video, hence why it was being quoted. When it comes to variances in liturgical practices I may be one of the few experts on the subject in the world. I doubt anyone else has bishops from multiple jurisdictions calling them up and asking them about liturgical practice. Anything else I would say to you at this point would just be an ad homien. I am done with you. Interesting. In our tradition, the chorepiscopos is allowed to use some pontificals (canonically, he has some powers that a regular priest does not have, although he is not a bishop). He may wear a red cassock instead of black, wears a pectoral cross, uses a staff, and in the Liturgy also makes use of a hand-cross, and uses the "mitre", but in a different way from the way bishops wear it. The Syriac "mitre" is really more of a "veil", worn over the head. On top of this goes the phelonion and omophorion, and the hood is lowered or raised by the bishop when the rubrics indicate. But for a chorepiscopos, the "mitre" is merely draped over the shoulders on top of the phelonion. He never makes use of the omophorion. The Russian use of a mitre for priests is only an "award"? It doesn't come with a status that confers other rights/privileges? Page created in 0.156 seconds with 24 queries.